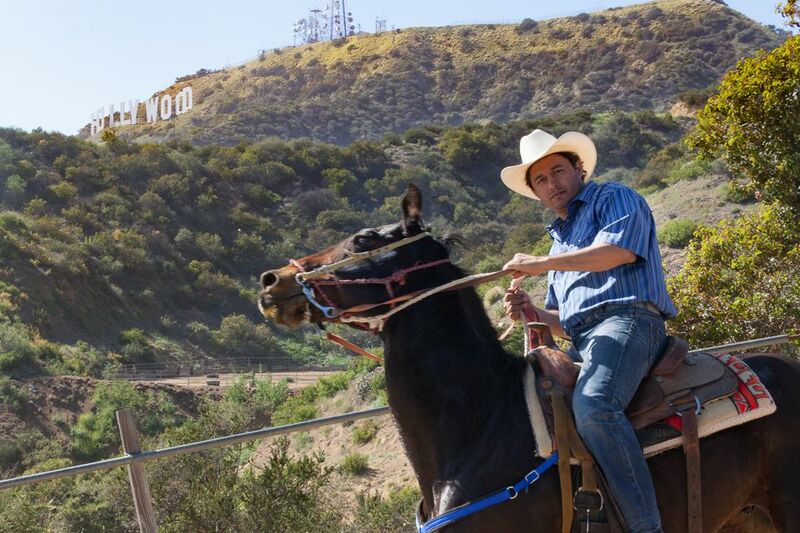 You won't see a lot of people riding horses up and down Hollywood Boulevard, but if you look up toward the Hollywood Sign, you may see people horseback riding across the Hollywood Hills. With nearly 100,000 horses in the city proper and even more in surrounding ranch areas and in unincorporated areas along the LA River, Los Angeles is a thriving equestrian center. The number goes up to over 300,000 horses including neighboring Orange County, Ventura County, San Bernardino and Riverside Counties, which all have abundant ranch country, so the cowboy life is alive and well all over Southern California. Most of the horses in LA are people's private animals kept in back yards and small ranches in the Valley or in Palos Verdes, where more properties are large enough to accommodate one or more horses and zoning allows it, or in a multitude of boarding stables across the county. If you're looking for boarding or lessons, there's a list of stables here. For visitors, there are numerous ranches in and around Los Angeles that provide guided trail rides and horse rentals. I have not personally used most of these companies, but I checked out their reviews on other sites and checked with people who have used some of the ones I haven't tried. A number of them have complaints about the person answering the phone taking reservations, but overall, customers seem pretty satisfied with their ride experiences. Horseback Riding on the Beach? Nope! Note that there is NO riding on the beach in Los Angeles or Orange County, so companies that advertise beach rides take you 2 to 5 hours north to other counties that allow beach riding. If you're staying in Santa Monica or in the San Fernando Valley, there are stables to the north offering trail rides in Topanga Canyon and Malibu that will be closer than Griffith Park and there are stables in Palos Verde and Huntington Beach closer to Disneyland. Westside Riding School is located in Will Rogers State Historic Park in Pacific Palisades, a neighborhood of Los Angeles that extends into the foothills of the Santa Monica Mountains between the cities of Santa Monica and Malibu. Will Rogers Trail Rides at the Westside Riding School provides 50-minute rides on the Inspiration Trail Loop, offering mountain and ocean views. It's about a 15-minute drive from Santa Monica Pier or UCLA, accessible from Sunset Blvd. About 35-40 minutes from Hollywood via Sunset. Reservations are recommended. They get especially busy on weekends and holidays. Closed Mondays. State Park parking fee applies. Los Angeles Horseback Riding is based in Topanga Canyon, a rustic Los Angeles neighborhood along Topanga Creek in the Santa Monica Mountains. Most of the Canyon is part of the Topanga State Park. They offer a variety of rides including, daytime, sunset, full moon and romantic proposal rides. They also offer ranch weddings and birthday parties. Los Angeles Horseback Riding is about 25 to 30 minutes from Santa Monica Pier; about 35 freeway minutes from Hollywood without traffic. When they're not doing equine psychotherapy - that's using horses to help heal people, not shrinking horses - Soul to Soul Equine Healing offers trail rides through the mountains and valleys of Malibu. All proceeds go to help veterans, victims of abuse, and addicts in recovery. they are located just south of the 101 Freeway in Agoura Hills, about a 45-minute drive from the Santa Monica Pier via multiple routes, or 35 minutes from Hollywood without traffic via the 101 Freeway. Connemara Ranch at the Shalom Institute is primarily a facility that offers therapeutic programs for physical and mental health and socialization using horses. They also offer small group (up to 8) and private trail rides. They are 50 minutes to an hour or more from the Santa Monica Pier, and about the same distance from Hollywood. Malibu Riders offers trail rides in Zuma Canyon in Malibu and in Agoura Hills, north of Malibu. The Zuma Canyon trail is on the cooler coastal side of the mountains with ocean views. One of their Agoura Hills trail rides goes to the old west town movie set at Paramount Ranch. All their trails are round trip loops, so you don't see the same view going out and back. Note: I have never used this company, but people I know say the staff on the phone were very rude and unhelpful, especially for people trying to use discount vouchers. Ocean Park Ranch offers private guided trail rides at three locations in Los Angeles (Porter Ranch), Woodland Hills and Simi Valley. All their tours are private, so they can easily adjust to the experience of the riders. They only have a few horses, so they don't do groups. Check the website for their three locations. although Porter Ranch is in the City of Los Angeles, it is farther than Topanga and about the same distance as Malibu, but on the inland side of the mountains. Daily on to two-hour trail rides in the Santa Monica Mountains northeast of Malibu. It's on the inland side of the mountains, so expect hotter temperatures than on the coastal side. Appointments are not required but recommended for groups of 10 or more. Group rates are available. Evening rides are available by appointment only. It's farther from LA than most of the other stables with trail rides, but it one of the few willing to book private sunset rides. From Santa Monica or beach cities to the south, Palos Verdes Estates is a great place to ride, with the advantage of cool ocean breezes most of the year. Palos Verdes is also easily accessible from Downtown LA down the 110 Freeway. Wagon Wheel Ranch offers guided trail rides on the 66 miles of trails in the Palos Verdes Estates near San Pedro 365 days a year. This is a great area to ride. Since it's closer to the coast, it's cooler than the inland trails in summer with stunning ocean views. This is bout 20 minutes from the World Cruise Center at the Port of LA in San Pedro if you're coming in from a cruise, 25 to 30 minutes from downtown Long Beach, 30 to 45 minutes from Downtown LA, 40 minutes to an hour from Santa Monica and 45 minutes to over an hour from Hollywood or Disneyland. If you're staying near Disneyland or any of the Orange County beach cities, the Horse Play Rentals at the Huntington Central Park Equestrian Center in Huntington Beach is a good option. Horse Play Rentals offers one-hour guided trail rides through the rural hills of huntington Beach, overlooking Huntington Central Park. Birthday party packages are available. They also have the on-site the Therapeutic Riding Center, working with individuals with physical and developmental ailments, and Horse Play Therapy program addressing mental health and learning issues. The therapeutic Riding Center is part of the Horses for Heroes program, offering a free ride to active duty personnel, reservists, veterans, first responders, critical care and hospice nurses, and special needs school teachers and their families. When to Go. Spring and winter are the best times of year to go riding in LA. During the summer, June through October, it's usually 20 degrees hotter inland than at the coast, and some of the trails have little shade. If you're riding in summer, schedule your inland ride as early as possible. Coastal rides are a little more temperate. Winter and spring are also better because whatever rain we get makes the scenery green, rather than summer brown. Try to avoid riding during windy Santa Ana heat waves, which can occur any time of year, but are more frequent in late summer and fall. Check the Amenities and Arrival Time. You are usually advised to arrive 15 to 45 minutes before your ride to fill out paperwork, etc. If there are a lot of other riders, some companies will not wait for you if you are late. Trail rides that begin at a ranch, stable or equestrian center generally have access to shade and restrooms while you're waiting for your group to assemble. Rides that meet at a trailhead do not. If you're driving from a distance and will likely need to use the facilities, book with a company with a physical base of origin. Communication. Many of the stables are out in the mountains and canyons. Be sure to ask for the name and cell phone number of the guide if you are meeting at a trail head, and leave your cell phone number so they can call to track you down if you are delayed. Get the Best Directions. Check the website for specific directions, rather than trusting your GPS or cell phone, especially if you are meeting at a trail head. Map programs are not always accurate at pinpointing some of the rural addresses, and the address may indicate a park entrance, but not where to find the check-in building. You may also lose your cell signal in the hills and canyons, so your map program won't work. What to Wear. Long pants that are neither too tight nor too loose are recommended and often required. Closed-toe shoes are also required. Tennis shoes will do, but boots or shoes with a thick one-inch heel and not too much tread are even better for gripping the stirrups. Helmets are provided. Some companies require them. Others make them optional for riders 16 and older. If you're not planning to wear a helmet, bring a hat. Even if it's cloudy when you start out, it may clear up and heat up along the way. Don't forget the sunscreen, regardless of the weather. Cameras. Generally, cameras are welcome and encouraged on trail rides, and guides will stop for photo opportunities. An exception is Huntington Central Park Equestrian Center, which has a no camera policy, ostensibly because you need your hands for riding, but probably because there are some very un-scenic parts of the ride. Minimum Age. Young children generally are not allowed on trail rides. The minimum age varies by company, usually 6 to 8 years old. I have seen pictures of a saddle with a toddler seat on the back, but none of these companies advertise that option. Maximum Weight Limit. Most companies have a maximum weight limit of 200 lbs, but there are a couple with larger horses that have a 235 weight limit. Stables may charge more for the bigger horses that can carry heavier riders because the bigger horses eat more and therefore cost more to maintain. Ask before booking what the weight limit is, and if there is an over-weight surcharge. How Much Training Will You Get? The answer to that varies by company. Generally, the bigger the group, the less instruction you get. You'll be given a helmet, assistance getting on the horse, and told how to hold and use the reigns and your knees to direct the horse. That's pretty much what you need to know to walk your horse in a line along a trail. On private tours, you may get more coaching as you go. What's More Romantic than a Gondola Cruise - in Southern California?